There's no need to be a skier to glimpse Aspen’s best mountaintop views. Just jump into a snowcat and head up Aspen Highlands for an intimate four-course dinner at the Swiss-style Cloud Nine Alpine Bistro. Dinner is only served on Thursdays, but the restaurant is open for your fondue pleasure every day during the winter for lunch. There’s no need to be a skier to glimpse Aspen’s best mountaintop views. 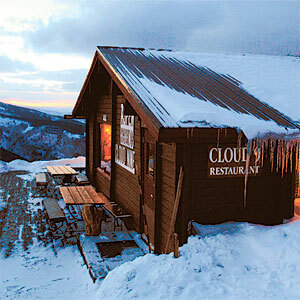 Just jump into a snowcat and head up Aspen Highlands for an intimate four-course dinner at the Swiss-style Cloud Nine Alpine Bistro. Dinner is only served on Thursdays, but the restaurant is open for your fondue pleasure every day during the winter for lunch.